Alcides Costa and Cristina Martinez salute a key mentor. February 2018 – Indelible words of encouragement. After nearly 20 years of teaching at Drew University, that’s what Rodney Gilbert left with his theatre students. So, out those words flowed during an emotional tribute on campus for the beloved professor who died in November. Andrew Binger, a 2013 graduate, recalled how Gilbert addressed a handful of actors that he cast for his production of August Wilson’s King Hedley II in 2015. Binger, who played Stool Pigeon, was among them. Gilbert was also compassionate toward colleagues. Assistant Professor Kimani Fowlin described him as an “instant brother” who was supportive of both her and her son. Costa, Fowlin and Binger were among a dozen speakers at the tribute, held at the Thomas H. Kean Black Box Theatre. Others included fellow professors, school administrators and colleagues from Yendor Arts, the Newark-based community arts organization that Gilbert founded. 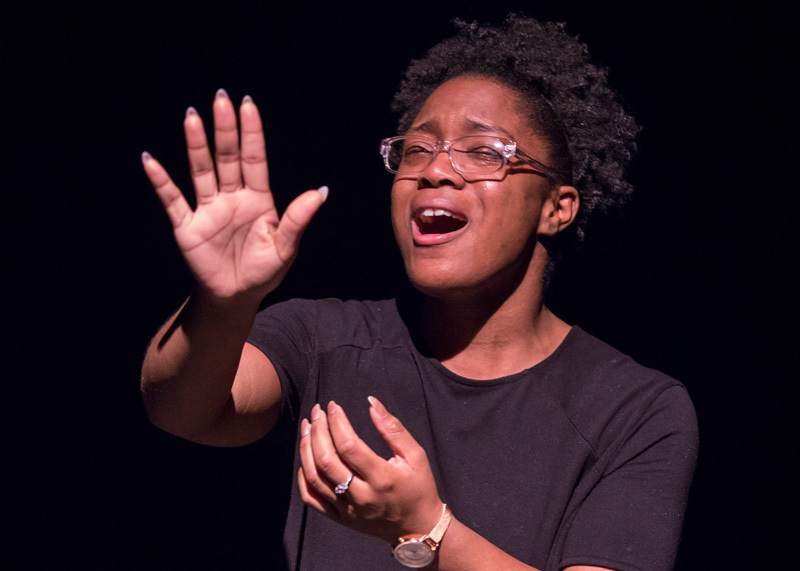 The event blended heartfelt testimonials with student and alumni performances of scenes from plays such as A Raisin in the Sun, King Hedley II and New World Disorder.